Complete two puzzling pictures of Frank Lloyd Wright's Fallingwater. When the Kaufmann family told Frank Lloyd Wright they wanted a summer house near their favorite waterfall, their architect responded in his infamous, inimitable style: He designed the house to cantilever right over the waterfall. A rock they once liked to picnic on protruded through the living room floor to form the hearth. 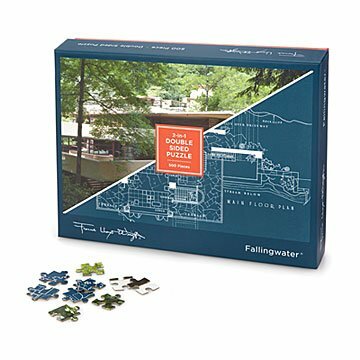 In this puzzle, 500 perplexing pieces form dual representations of Fallingwater, Wright's rural Pennsylvania masterpiece. One side is a breathtaking photograph of the iconic house and its dramatic site, while the other is a blueprint of its boldly modern floorplan. To help keep this house in order, the photo side is glossy, while the blueprint side is matte. Complete with an insert about Wright and Fallingwater, it makes a great pastime for any architecture lover. Made in China. We really enjoyed putting this puzzle together. It was challenging but fun. We are very disappointed with the quality of the pieces, as at least 1/4 of the have curled edges. You know that smooth feeling when you rub your hand over a finished puzzle? Not with this one, it's bumpy all over. I took photos but not sure how to add them to this review. With so many five star reviews, I'm wondering if we managed to get the one that didn't go through quality control. Wish I could recommend this puzzle, but unfortunately I can't. The best thing about doing a jigsaw, especially with others, is that no one is on their phone. You can work on it, walk away and come back...if you have some self-discipline. I love when I find something uniquely perfect for the person I'm gifting. Good job Uncommon Goods, you've done it again! I'm excited to give this to my dad for Christmas. He loves Frank Lloyd Wright and just retired, so I think the timing will be perfect! I absolutely LOVE Uncommon Goods and have purchased many gifts for Christmas presents. Your staff is awesome, too! Was a birthday gift for my mother. She really liked it. My folks live in an area that gets snow during the winter. Once they have come in from shoveling they will sit down and work on a puzzle. i have been gifting puzzles to them for years, the more difficult the better! Cannot wait to add this to their stash! Pleasantly surprised by this puzzle. We rate puzzles as one day or three day puzzles, this was a one day puzzle on the picture side. It was engrossing, so we stayed up late to finish.